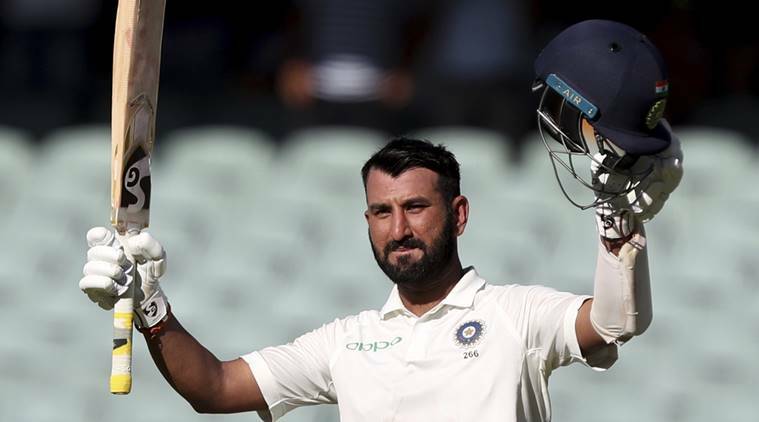 Cheteshwar Pujara showcased immense level of discipline on the pitch as he reached the three figure milestone to guide India to a respectable score at the end of day 1 here at Adelaide. As usual, Pujara paced his innings in a slow manner, gradually increasing his scoring rate as the innings progressed. He played a key factor again, taking India from 19/3 at one stage to 143/6 at Tea. He then took command accelerated to 250/9 at stumps. Earlier, Virat Kohli won the all crucial toss and chose to bat first. He decided to leave out Hanuma Vihari from his initial squad. The openers failed to make use of the batting track, playing shots away from the body and holding out to the slips. Virat Kohli and Ajinkya Rahane, who followed the openers too did not last long. A blinder of a catch from Khawaja in the slips saw Kohli’s innings halt at 3. Rahane as usual failed to convert his start and eventually fell for 13. The morning session was all Australia with India going into Lunch at 56/4. Starc and Josh Hazelwood got the Test underway and were on the mark from the word go. Post lunch saw Rohit Sharma take matters into his own hands, blasting a few sixes off Cummins and Lyon. But having played one shot too many, Rohit was caught out in the deep after having scored a brisk 37. Rishabh Pant (25) too arrived with intention of attacking. He scored two fours and a six in the space of a few deliveries, before being asked by Pujara to play more steadily. They then added 41 runs for the sixth wicket. But attempting to play against his natural game, Pant edged one behind off Lyon to be dismissed shortly before tea. India enjoyed their best session post tea as the tailenders along with Pujara dug in to add some crucial runs to the total. Pujara strung together two crucial partnerships with lower-order batsmen to ensure India posted a competitive total. After Tea, Pujara added 62 runs with R Ashwin (25) for the seventh wicket. Cummins (2/49) finally got the breakthrough in the 74th over when Ashwin edged to second slip. Ishant Sharma (4) then put on 21 runs with Pujara take the score past 200 in the 79th over. With few overs to the close of play, Pujara reached his century with Shami at the other end. Following his century, he brought about his aggressive game, going after each ball he saw. But the 5th ball of the 88th over saw him being run out to a brilliant throw from Cummins, thereby calling for stumps. Brief Scores: India 9 for 250 (Pujara 123, Cummins 2-49, Hazelwood 2-52) v Australia.